I’ve been on holiday!!! It’s been ages since I went on holiday. If I’m not in Sarnano, then I’m in the UK and nice as that is, it doesn’t feel being on vacation. Anyway, this blog is dedicated to my trip. I apologise in advance for any rambling and the hundreds of photos but I was on my own and I feel the need to share! I have two main ‘go-to ‘inspirational people that motivate me in different ways: Margaret Thatcher, who was said to have only had 4 hours of sleep a night and managed to run the country. And my most recent one is Pane Caldo who, after work, drove almost 3 hours on his own to watch his football team lose, and then 3 hours back mid week. For me, if a drive is more than an hour, I rule it out. It never occurred to me to just not care! 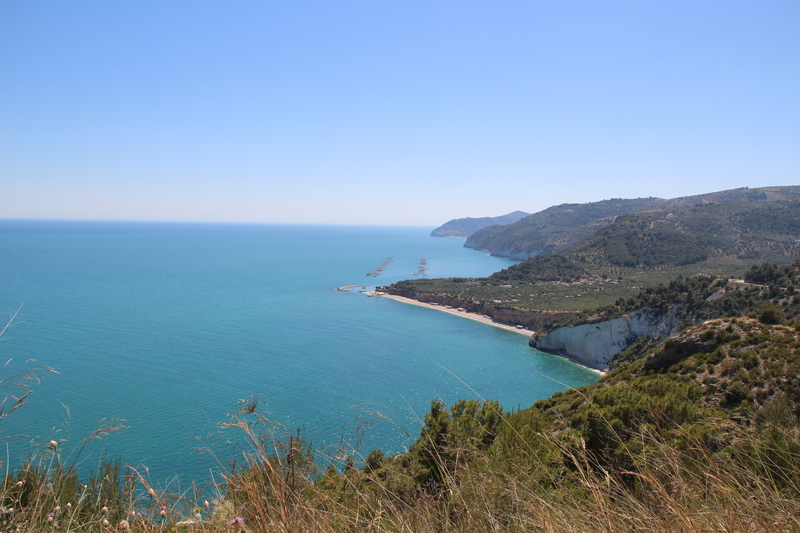 So, with that in mind, I waited for a gap in the rain and I drove 5 hours down to the National Park of Gargano (Puglia), the spur of Italy’s boot and somewhere I had wanted to go for ages. 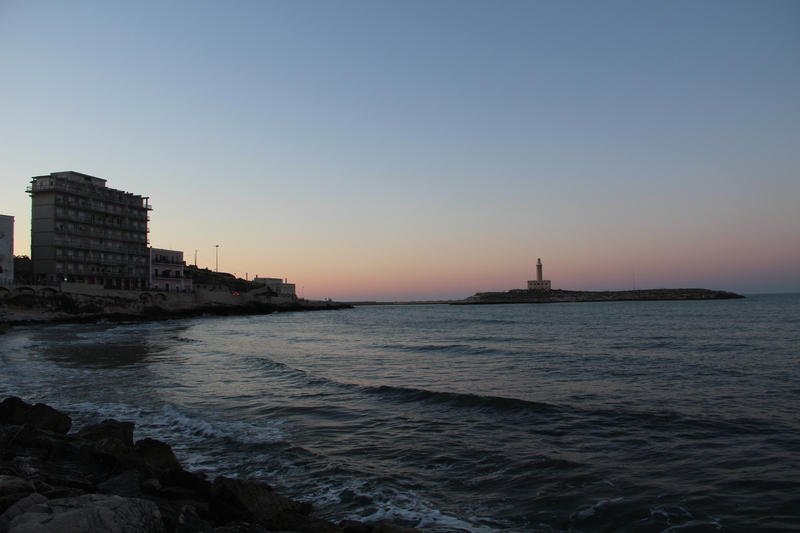 Puglia is like another country! All the fields are golden and dotted with lots of olive trees. There are goats wandering up winding country roads. The hills are terraced with old dry stone walls that must have taken years to do. There are pretty ‘Mediterranean-looking’ flowers. It has a completely different feel to it than where I am in Le Marche. 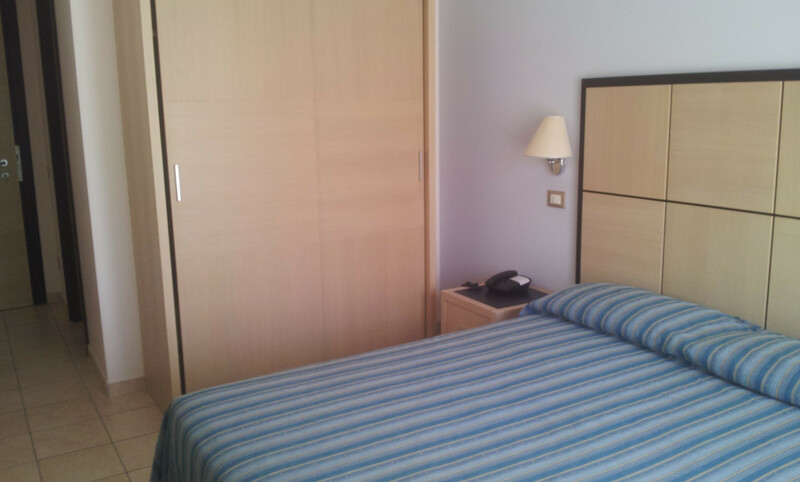 I stayed in the Forte Hotel in Vieste. It’s nice and good value (though be aware that the “do not disturb” sign does not work it turns out). The surrounding area however, is an odd mix of other nice hotels, building sites, rubbish and a donkey. (I was considering mounting a donkey releasing campaign but I didn’t think I could hide him in my hotel room and he doesn’t fit in the car, so I settled with singing “Little Donkey” to him when I went past). So the immediate surrounding area around the hotel doesn’t look that impressive. There is a golden sandy beach but, seeing as though it was quite windy, a lot of the sand had spilled onto the pavements leaving not so enticing heavier rubbish behind on the actual beach. I think it’ll perk up considerably in the summer though (the Italian Summer is strictly between 1st July and 31st August). 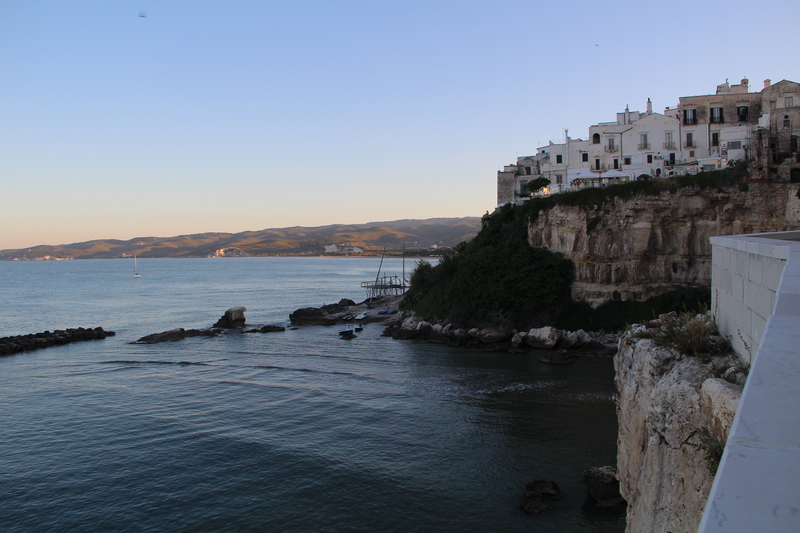 The main town area of Vieste is nice. Everything is white with marble pavements (be prepared to slide across large sections if you have no grip on your shoes/flipflops. 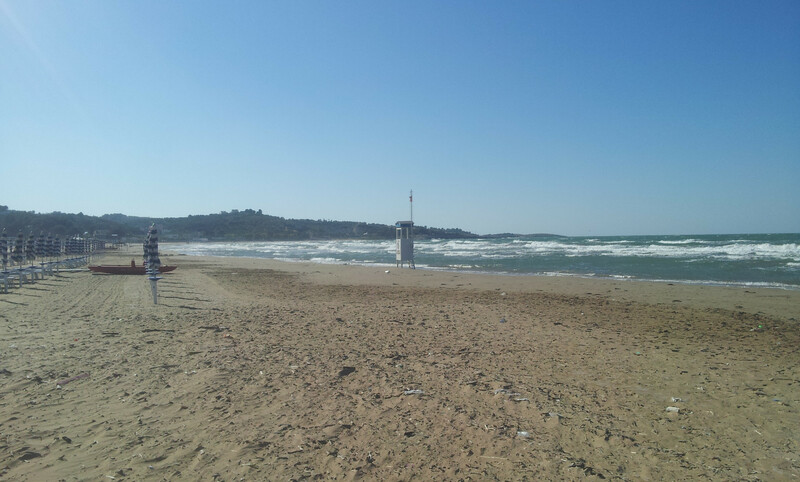 When it rains I imagine one could aquaplane their way down from one end of Vieste to the other without ever lifting a foot). My favourite part was the old town up on the hill. It’s full of winding cute little paths and places to eat. There’s a castle at the top which seems to be a military zone so you can’t go in but it has some spectacular viewpoints around it. There’s also a pretty church on the hill and a cathedral at the bottom of it. 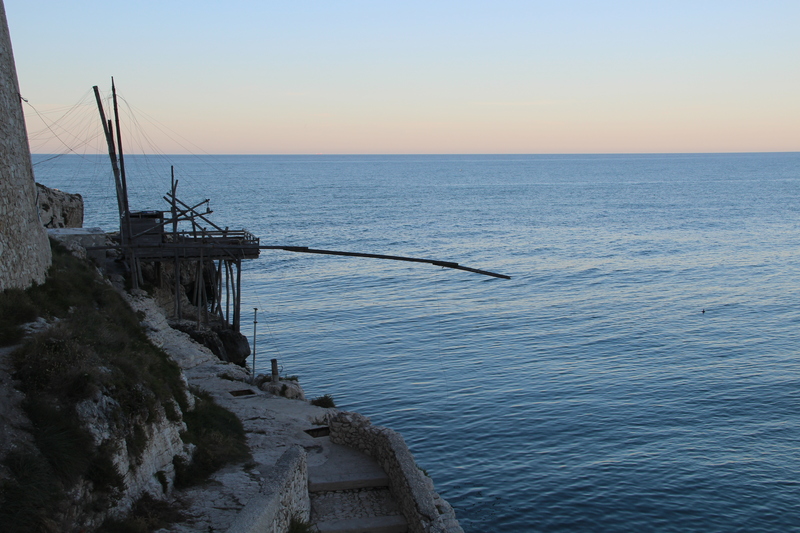 This is a weird fish collecting contraption – there’s quite a few around the coast – I assume they’re not used anymore. Huh! I’ve just realised where this was taken. 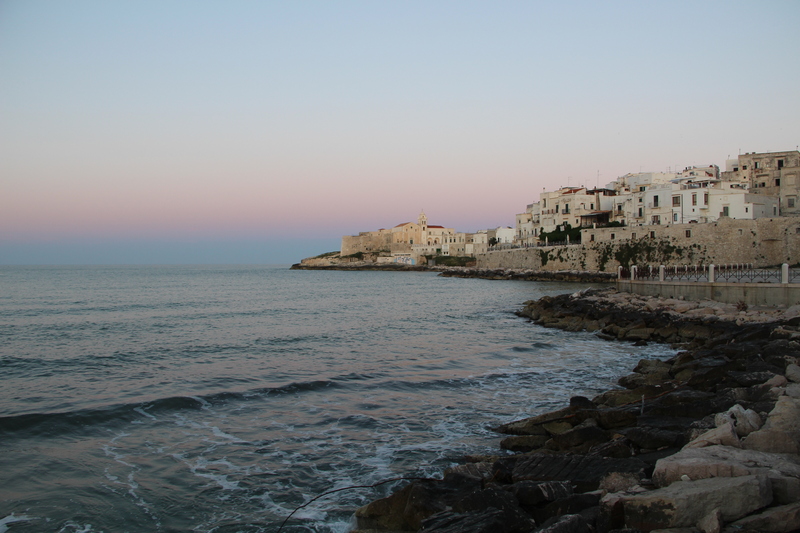 The weird thing about Vieste in the old town, is that you go for a walk in a straight line and end up where you started! Anyway, this is the view from the opposite side of one of the previous photo. 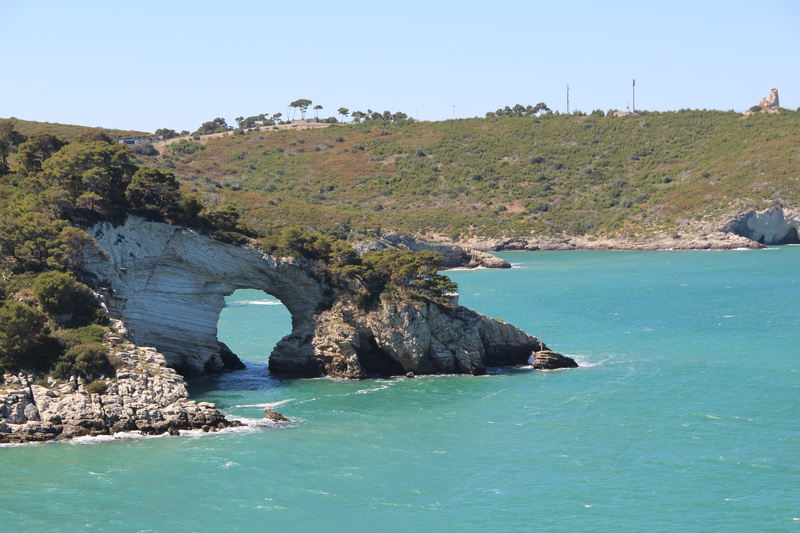 From Vieste you can go on boat trips to the Isole Tremite (3 islands nearby known for their lovely blue waters. Mussolini put his political prisoners there. Not a bad place to be held prisoner really) and the Grotte Marine (there are a number of caves in the cliffs around Vieste). 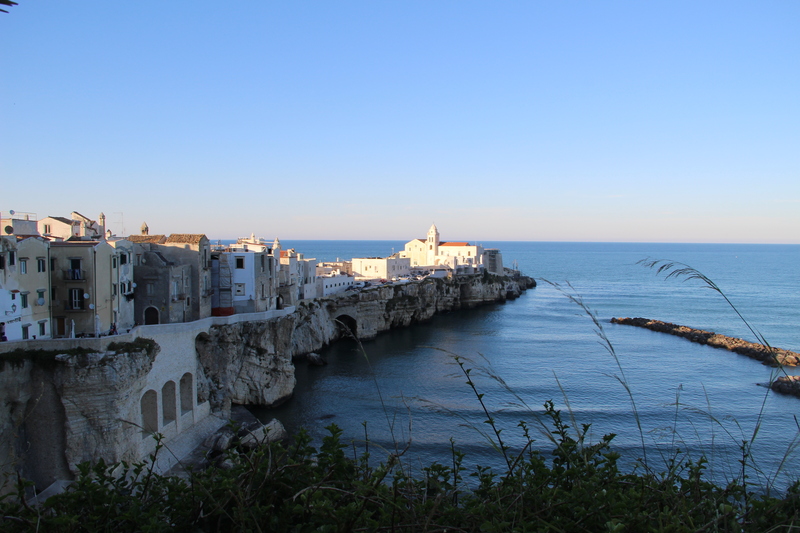 If you wander around Vieste there are lots of tour companies offering these boat trips. I decided to ask one guy in a little rundown shack advertising the trips, my theory being that his company wasn’t having to subsidise a fancy shop so he might offer a better deal. My theory didn’t hold. The costs seemed to be largely similar. Anyway I turned up at 8am the following morning at the shack as agreed but nobody was there so I resolved to go to one of the other companies dotted around the port. 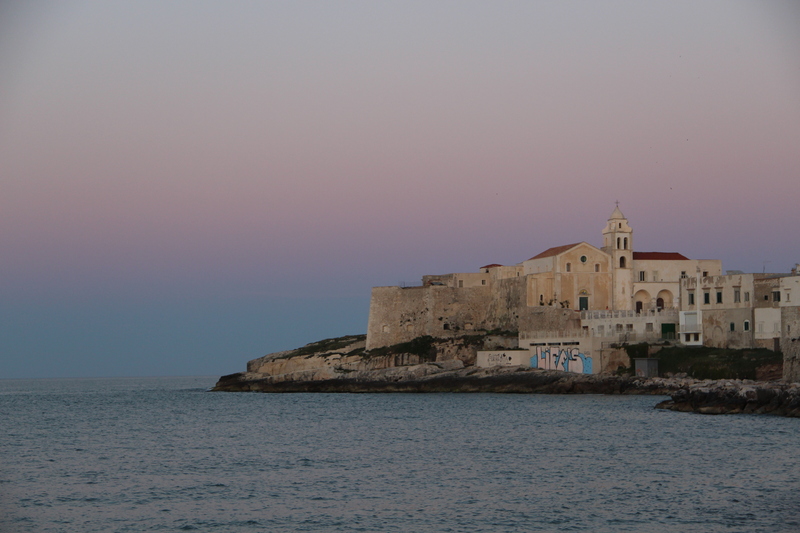 I walked along the port and didn’t see any tourists; just a bunch of weathered looking men leering at me as I went past. As freeing and liberating as it should be to go on holiday by yourself, the idea of going on an all day boat trip with either one leery man or several didn’t appeal. I’ll just have to go again with reinforcements another time. This is the port where you would take the boat to the Tremite if you were going! My Plan B was a drive to the Foresta Umbra (the Shadowy Forest). On reflection if I was after a safer alternative to the potential all-creepy-man boat trip, this wasn’t really it. It took a while to find, mainly because if you look online, there is no “address” for the forest; it just sprawls across several comune’s which isn’t really helpful when you’re trying to find it using GPS. The forest in fact, is reasonably well sign posted although as usual, there were several T-junctions signs missing and inevitably I would always take the wrong turn. However, if you take a direct route it takes 30 minutes from Vieste and the open olive fields suddenly turn into leafy old forest. It’s a beautiful road that takes you through the forest – albeit epileptic fit inducing with the sunlight flickering through the trees. 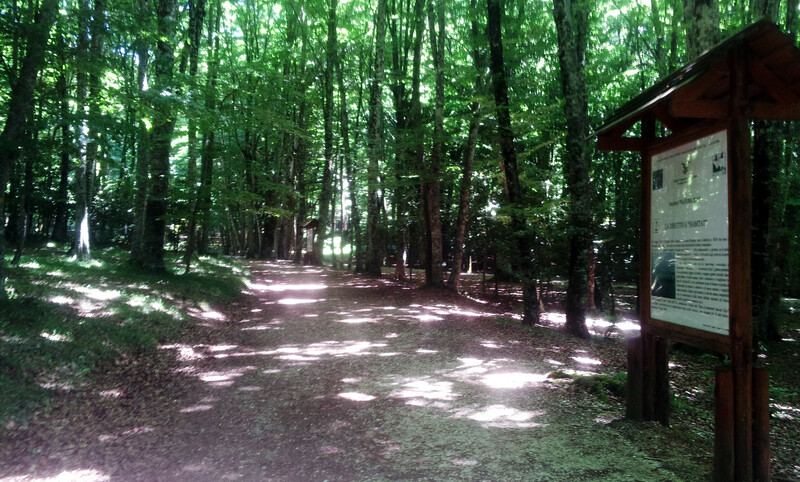 The forest itself is stunning and appeared to be very well maintained. I’ve never seen such lovely open paths. When I go for a walk in my local woods, I have to use my imagination to work out what is a path or not and at the end of it, I usually end up having to crawl through undergrowth to get out. It’s not like that here. Every few meters there was a picnic spot with several tables, chairs, parking spots and often a walking trail. Absolutely lovely. Look at the nice wide path with a lovely big sign!!! This is the laghetto – little lake. However, after my friend and I had a scary encounter with a nutcase in a very similar forest years ago, my forest risk radar is heightened so I didn’t venture in too much. 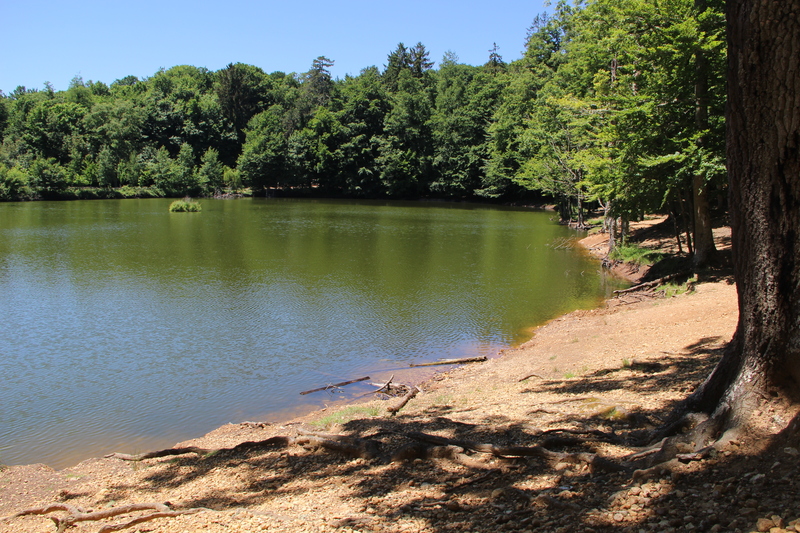 I did however find what seemed to be a well-trodden little walk around the “laghetto”– a cute little lake full to the brim with tadpoles (presumably frogs if anyone goes later in the year). Conscious of not wanting to be entirely on my own, I latched onto a nice looking couple that were going for their own walk around the lake keeping a healthy distance between us so as not to appear suspicious. Alas, I don’t believe I succeeded in being suspicion free. They kept stopping, presumably wanting me to pass but I would feign interest in my phone and stop too for the same amount of time. I wonder if in years to come they’ll write blogs about the Stalker Woman of the Foresta Umbra. 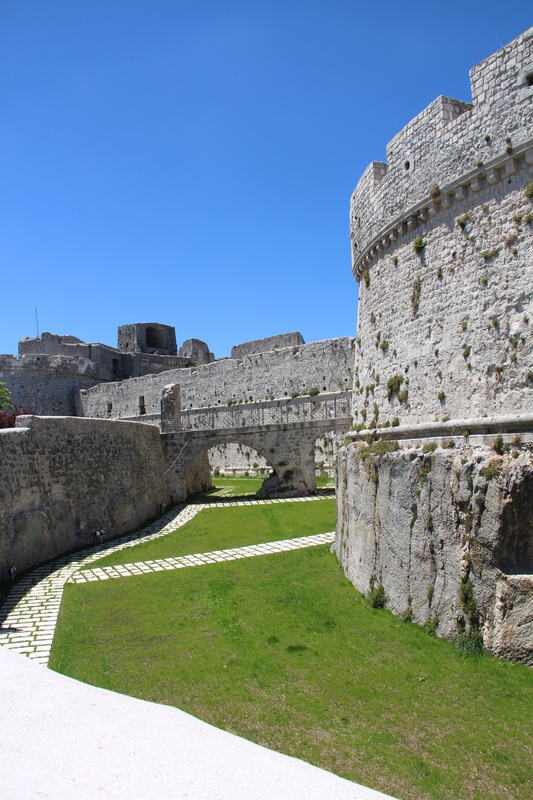 Then, deciding towns and cities were probably the way forward, I went to Monte Sant’Angelo. I’m not fussed about that place. I felt like the locals were trying to do ‘the hard sell’ – parking was expensive and didn’t really seem that official, and people came up asking me to go to their restaurants. I was actually hungry so found a little trattoria run by a man with a dark brown toupee with his white hair in what I thought was a very courageous non-blend style. I had orecchiette (little ear shaped pasta) and tomato sauce. Meh – it was alright. There wasn’t much else to the place – there was a nice castle (which was closed) and lots of tourist shops but otherwise, it just felt a bit derelict and unloved. I do feel sorry for it though – there are no local businesses and tourism is all they have so no wonder they try and make as much out of the tourists as they can. But they had nice bread! 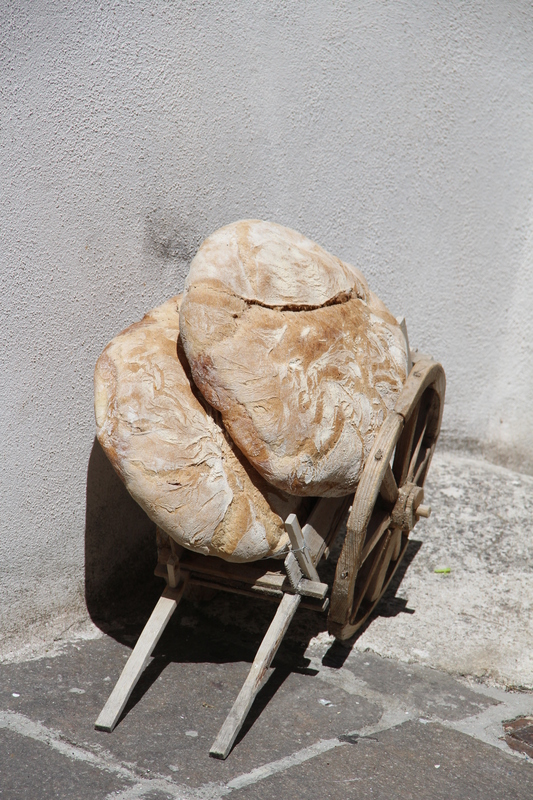 It’s like I said earlier, Puglia is like another country! When I was making my first sourdough loaves a while back, they came out like hard flat disks but they actually sell that here as a sort of regional speciality. I’ve been missing a trick! My first bread attempts looked like this! It’s very difficult to get sourdough to stay in a recognisable shape so it squidges out and this is what you get. I hadn’t realised that was a valid bread form! 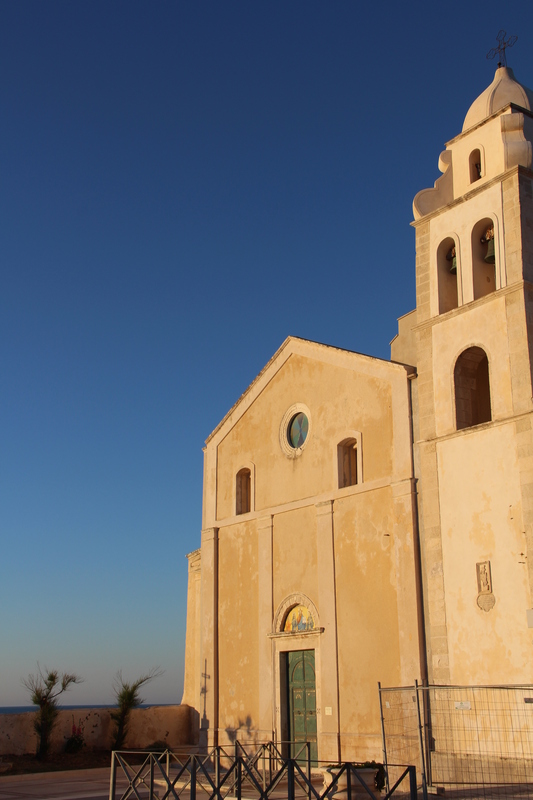 From Monte Sant’Angelo, I took the coastal road back to Vieste. It took ages to get back to the hotel because I kept stopping to take photos! 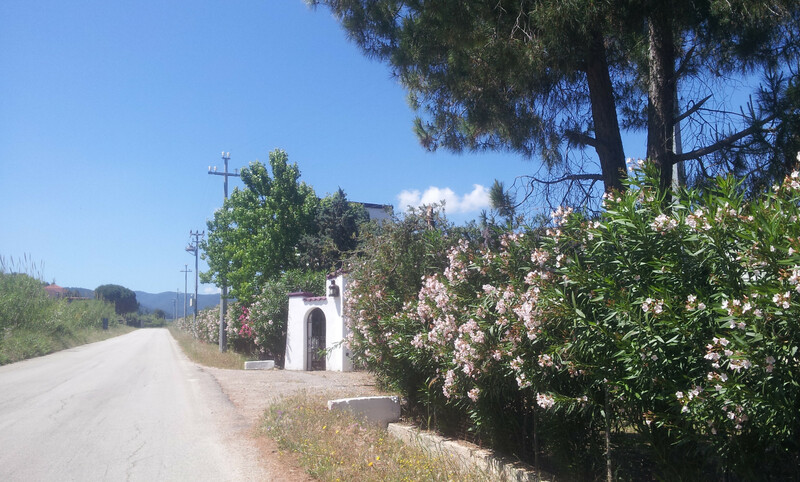 It has a very pretty coastline with unbelievably blue sea and with the ginestre (“gorse” in English – I think we should adopt the nicer sounding Italian word) out and some other pretty purple flowers, it really did look spectacular. I know there’ll be a scientific explanation for this but it’s very odd to have such a perfect hole in a massive rock! I think that’s about it on the holiday front. I hope you’re all having good weekends. Hi Lyn, Ah good! The jet boat sounds like a really fun thing to do! Did you go at a more conventional holidaying time? I’d love to go back and do the caves! I checked out the pictures online and they look amazing! We were there early June. We were the only English speaking tourists also. Looks like an amazing place for holidays. The hotel looks quite decent and the old town pretty nice. But what I like most is the nature for sure. It looks great! Hi Moritz! Thanks for the comment 🙂 Yes, beautiful place to go to – definitely worth going to check it out. I love your blog idea – reviews of luxury holidays around the world! I should have done that!!! I usually end up going for the cheapest option so I’ve had a number of disasters to say the least 🙂 I see you’ve been to Rome though, beautiful city. If you’re into nature though definitely worth coming up to the Le Marche region and checking out the Sibillini Mountains! You are so brave to do all that driving and finding your way around, neither of which are easy on your own anywhere, and specially not in italy with the eccentricities of the signposting. 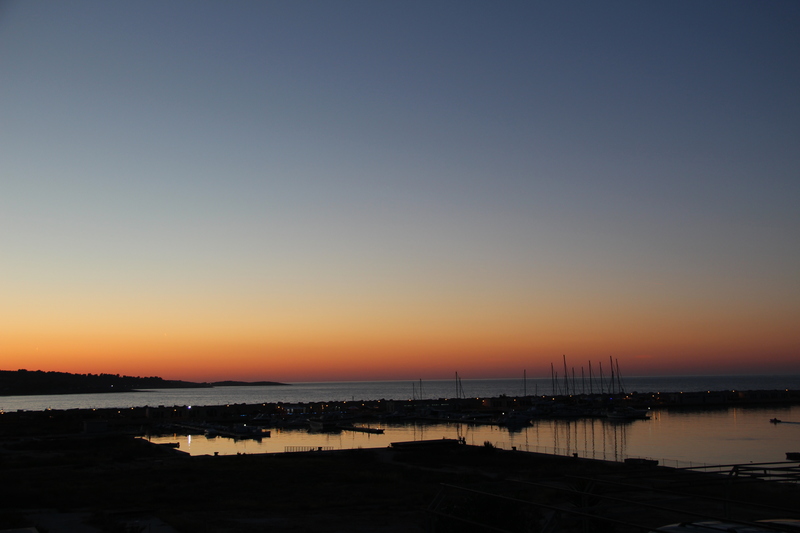 Loved the photos – you have captured that beautiful sunset light. Looks lovely. 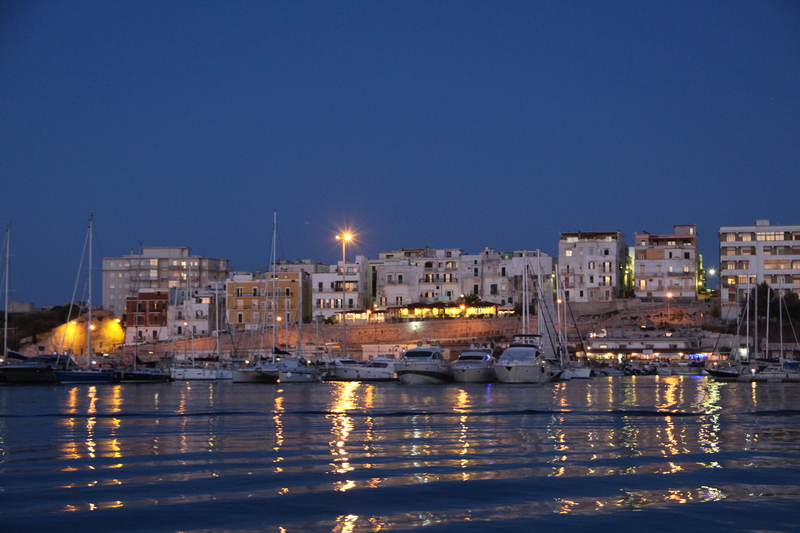 I’ve only visited Puglia during overnights at Brindisi in the past, but really fancy going back. How was the food?